Protesters demonstrate outside the Starbucks at 18th and Spruce Streets. Philadelphia's mayor's office and Police Department have begun separate investigations into the arrest of two African American men waiting to meet an acquaintance at a Center City Starbucks on Thursday after a video of the incident was widely shared on social media, triggering national outrage. Mayor Kenney said in a statement Saturday afternoon that the city's Commission on Human Relations has been asked to examine Starbucks' policies and procedures, including whether its training includes safeguards against "implicit bias," or unconscious stereotyping. "We are reaching out to Starbucks to begin a discussion about this," he said. A police spokesman, meanwhile, said the department's internal affairs unit is probing the incident at the coffee shop at 18th and Spruce Streets. Police Commissioner Richard Ross said earlier Saturday that officers had acted appropriately. In the clip, the two men can be seen being escorted from a table at the cafe in handcuffs while a white man, who has been identified as Philadelphia real estate investor Andrew Yaffe, asks why officers were called and attempts to explain to police that the two men were waiting for him. "What did they get called for, because there were two black guys sitting here, meeting me?" Yaffe asks in the video. "What did they do?" Commissioner Ross said in a video posted to Facebook on Saturday afternoon that police responded around 4:40 p.m. Thursday to a 911 call reporting a disturbance. The men had refused to leave the cafe after asking to use the restroom without placing an order, which violated Starbucks policy, staff members told police. The men were detained after they refused officers' requests to leave as well, Ross said. "The police did not just happen upon this event — they did not just walk into Starbucks to get a coffee," he said. "They were called there, for a service, and that service had to do with quelling a disturbance, a disturbance that had to do with trespassing. These officers did absolutely nothing wrong." DePino said in an interview with the Inquirer and Daily News that she posted the video, which was recorded by a woman sitting next to her at the coffee shop, immediately after the men's arrest, which she said involved about eight officers. "They did not raise their voices; they were not confrontational," DePino said of the men. Police "put them in handcuffs and essentially perp-walked them out of the store." DePino said she was told by Yaffe that the men were family friends of his and that they had been waiting to meet him about a real estate deal. Reached by phone, Yaffe declined to comment. Attorney Lauren Wimmer, who agreed to represent the men pro bono after being contacted by Yaffe, said she was told at 12:30 a.m. Friday that the two were being released from custody. She declined to identify the men. Ross said the men were released after officers became aware that Starbucks "no longer was interested in prosecuting." As the video of the men's detention spread, Starbucks was accused by some of tolerating racism by its staff. Many on social media asserted that the men would not have been treated similarly if they had been white. "Waiting in a Starbucks while black is a crime?" tweeted the Roots' Questlove, a Philadelphia native. 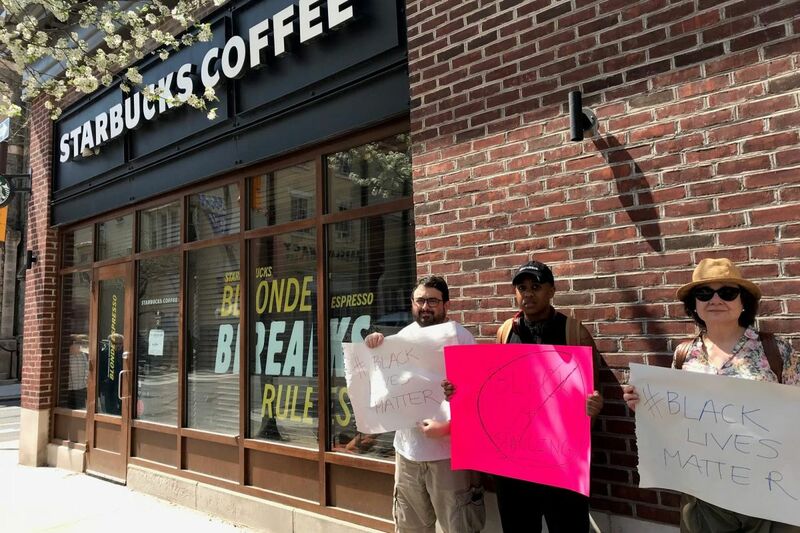 The 18th and Spruce location was busy Saturday afternoon despite scattered protests outside the coffee shop. Demonstrator Toni Bowers, who lives nearby, said she was "outraged" by the incident. As pressure grew, Starbucks released a statement Saturday expressing regret about the incident. "We apologize to the two individuals and our customers and are disappointed this led to an arrest," the chain said. "We take these matters seriously and clearly have more work to do when it comes to how we handle incidents in our stores. We are reviewing our policies and will continue to engage with the community and the police department to try to ensure these types of situations never happen in any of our stores." Kenney said in his Saturday afternoon statement calling for a review of Starbucks policies that the incident "appears to exemplify what racial discrimination looks like in 2018." "Like all retail establishments in our city, Starbucks should be a place where everyone is treated the same, no matter the color of their skin," he said. "Starbucks has issued an apology, but that is not enough." Police spokesman Troy T. Brown, meanwhile, said the department's internal affairs investigation is "active and ongoing." "We are a department that's always looking to enhance and improve upon ways that we do things," Ross said in his Facebook video. "In cases like this, we will examine this one, and similar ones to see if there are things that we can do better."